Are you planning a liveaboard dive trip, and you want to include an encounter with the largest shark on the planet? Whale sharks are a favorite for scuba divers, and it’s easy to see why a swim with these gentle giants tops so many bucket lists. In this article, we’ll walk you through the best liveaboard destinations for diving with whale sharks and help you plan your perfect trip. Taking the plunge with these slow moving filter feeders is easy, but you have to know where to go. Whether you prefer an exotic holiday in the Maldives or a cold water adventure in the Sea of Cortez, we’ll help you find your dream itinerary. If you are new to diving or planning your first onboard safari, check out our guide on how to get started with liveaboard diving. One of the planet’s most popular places to dive, the Galápagos Islands are a showcase of biodiversity. In fact, one in five species found in the archipelago exists nowhere else on earth. Your best chance of spotting a whale shark will be during the dry season when visibility is at its prime. Though this is also the busy season, dive sites remain uncrowded thanks to park regulations. 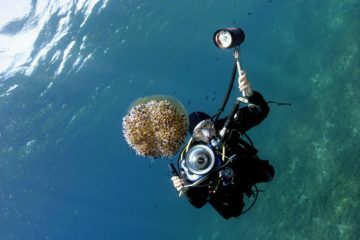 The area’s best dive sites, located at Darwin island, are reachable only by liveaboard. There, divers can spot other large pelagics like whales, hammerheads and reef sharks patrolling out in the blue. Other species found year round in the region include penguins, sea lions, manta rays, reef and hammerhead sharks, and marine iguanas. Due to challenging conditions and strong currents, divers should carry a certification level of advanced open water or higher. Prior experience with drift diving is advisable. With over a thousand islands in total, the Maldives is a classic tropical paradise of calm turquoise water and palm fringed beaches. The region features thriving coral reefs and massive cleaning stations, perfect for finding large pelagics like whale sharks and manta rays. Though they are present year round, your best chance to encounter a whale shark is during the dry monsoon season. During these months, the region experiences huge plankton blooms, attracting the sharks to feed. The Maldives are famous for excellent diving conditions year round, and a stunning variety of wildlife. Underwater photographers will discover a wealth of macro life to shoot besides the area’s better-known residents. Thanks to gentle currents and good visibility, even the most novice certified diver can enjoy a Maldives liveaboard. If you prefer luxury accommodations, the Maldives offer plenty of opportunities to splurge. Some of the world’s most high-end liveaboards operate in the atoll, many of which feel more boutique hotels than boats. Made famous by Jacques Cousteau, the Sea of Cortez is still known as the world’s aquarium. In other parts of Mexico, whale shark encounters are limited to snorkeling. But during winter and spring, divers around La Paz and Cabo San Lucas often encounter whale sharks mid-dive. In addition to whale sharks, the nutrient rich waters found around Baja California attract a variety of megafauna. Whales, dolphins, sea lions, and manta rays are some of the region’s other underwater attractions. The topography of this area is mostly rocky reef, submerged boulder fields and giant pinnacles. You can expect to see coral, but not in large colonies. Cabo Pulmo National Park is a frequent stop for liveaboards along the Baja California Sur coast. This protected reef is the western hemisphere’s most successful preserved marine area. Over 6,000 species call the park home, many of which are rare or endangered. Your best chance to see a whale shark is at the El Bajo seamount, thanks to its deep open ocean surroundings. Western Australia is home to 150 miles (260 kilometers) of fringing coral reef, supporting over 500 species of fish and 200 species of coral. Guided by the Leeuwin current and seasonal plankton blooms off the coast of Exmouth, the world’s largest concentration of migratory whale sharks arrives here every March. Manta rays, humpback whales and dugongs also visit these waters to feed. While many tours in the area allow you to snorkel with the visiting whale sharks, your best bet for diving with them is booking a liveaboard traveling along the Kimberley Coast or visiting the far-flung Rowley Shoals. Ningaloo is also an excellent place to encounter more delicate marine life, like the weedy sea dragon, giant cuttlefish, wobbegong shark and blue-ringed octopus. Thanks to calm conditions year round, Western Australia is an excellent destination for beginner divers. 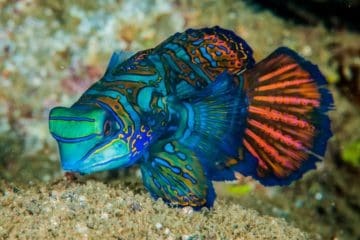 Excellent visibility also makes the region a top choice for underwater photographers. With over 7,000 islands, the Philippines is one of the most diverse destinations for scuba diving in the world. Donsol Bay is a warm, protected cove perfect for blooming plankton, the whale shark’s favorite food. This area is a frequent stop for liveaboard itineraries in Cebu and Visayas. It’s your best option in the Philippines for a chance to swim alongside the biggest fish in the sea. Within the bay, visitors are allowed to snorkel with the sharks, but scuba diving is not permitted. However, during their peak season, whale sharks are frequently spotted at nearby dive sites like Manta Bowl. Choosing an itinerary that explores the waters around Ticao Island increases your chances for a casual underwater encounter. Unfortunately, in some areas of the Philippines, whale sharks are hand fed to encourage encounters with tourists. Choosing an environmentally responsible operator protects whale sharks and other endangered species in the region. For the ultimate experience, book a whale shark eco tour with the Marine Wildlife Watch of the Philippines. The Bay Islands of Honduras are an up-and-coming liveaboard diving destination with a reputation. Known as “The Whale Shark Capital of the Caribbean,” Honduras is a divers favorite for spotting and swimming with these majestic creatures. The sharks are frequently spotted feeding on the surface between dives but can be found at depth in more remote locations. Utila, Roatan, Cayos Cochinos, and Guanaha offer opportunities to see the sharks, typically around seamounts and submerged banks. These sites, surrounded by deeper water, make convenient stops for passing pelagics. Schooling eagle rays, reef and lemon sharks, and dolphins frequent these locations as well. With only one boat currently operating in the region, liveaboard divers in Honduras are guaranteed to have private access to dive sites, making the chances of a whale shark encounter even greater. Honduras is a perfect destination for new divers, thanks to calm conditions year-round. It is also one of the most budget friendly places in the world to earn an open water certification. Just off the coast of Placencia, lies the Gladden Spit and Silk Cayes Marine Reserve. This protected area is a part of the Mesoamerican Reef, the largest coral reef in the northern hemisphere. Sea turtles, game fish and thriving coral colonies make this a favorite stop for liveaboards in the area. In addition to excellent diving overall, visitors during spring and summer have an exclusive chance to encounter whale sharks in these calm waters. Every year, over 30 species of fish visit the Belize coast to mate, in what is called a spawning aggregation. Once these fish have released their eggs, hundreds of whale sharks gather the shallows to feed. Whale sharks move very slowly while eating, and this is an outstanding time to swim or dive alongside them, and even take some close up pictures. Belize makes for an excellent liveaboard destination, thanks to its wide variety of dive sites. Virtually all itineraries include stops in this marine park as well as The Blue Hole, Ambergris Caye, and the Turneffe Atoll. Though conditions are suitable for beginners, liveaboard divers should carry an advanced open water certification to make the most of their trip. Many dive sites in the region, including The Blue Hole are at depths below 60 feet (18 meters). 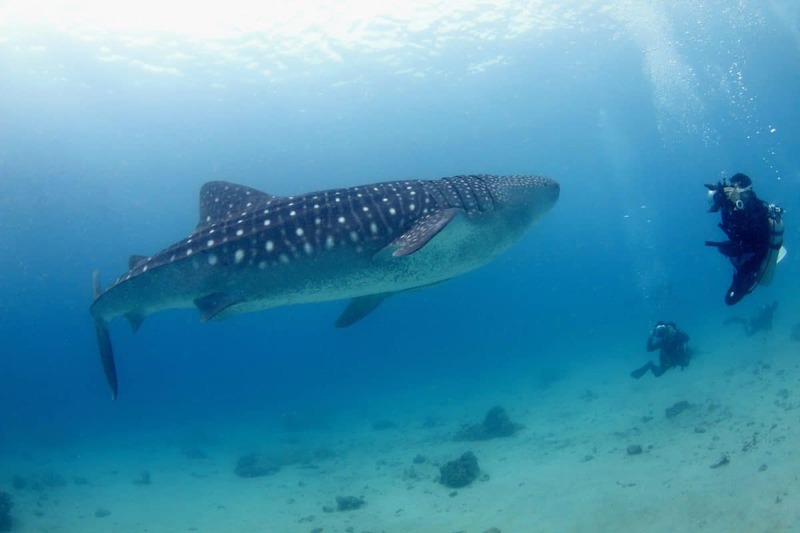 The dive sites around Koh Tao and the Chumphon islands are well known for whale shark sightings year round, but your best chances are during late Spring. Deep water dive sites like the Chumphon and Southwest pinnacles make good lookout points and are also home to turtles, rays, and a variety of macro life. Here, whale sharks frequently pass groups of divers out in the blue. Most liveaboards visit these classic locations, as well as White Rock, Shark Island, and the HTMS Sattakut Wreck. Liveaboards around Koh Tao offer short itineraries, perfect for beginner divers and budget travelers. If you are planning your first liveaboard, this may be a good option. During whale shark season, divers have a chance to both snorkel and dive with the sharks in one itinerary. These quick getaways create a unique opportunity for travelers on a time crunch and easily fit into backpacking plans. If you are considering continuing your underwater education, Koh Tao is one of the most affordable places in the world to earn dive certifications. 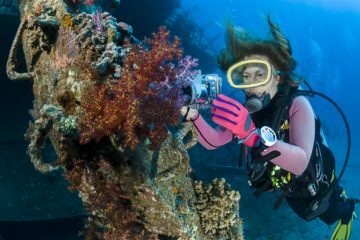 Underwater photography and Nitrox are the island’s most popular specialty courses. Cenderawasih is the ultimate experience when it comes to liveaboard diving with whale sharks. Divers are permitted to gather near local fishing platforms to watch the sharks display a unique behavior. Adult sharks, often joined by their newborns and juveniles feed on small fish that scatter around the fishermen’s nets. Because the local people view the sharks as good luck, this behavior is permitted and even encouraged. Whale sharks aren’t the only large pelagics that call the Cenderawasih Bay home. Sea turtles, pods of dolphins, and reef sharks are all known to frequent these waters, looking for a free meal. Though rarely seen by divers, the nearby mangrove forests attract the world’s only herbivorous marine mammal, the dugong. Because this area is only accessible by liveaboard, scuba divers can expect uncrowded sites and private encounters with wildlife. This region is also famous for World War II wrecks. Both Allied and Japanese boats are found in the bay and make an exciting addition to your liveaboard itinerary. Remember that a wreck diver specialty certification is required to enter any shipwreck. Liveaboard diving with whale sharks in Tofo is a unique experience thanks to two completely separate populations found in the area. The first is a resident population of sharks that never leave the region. The second is a migratory group. The deep-water Tofo corridor is often used by juvenile sharks for transit and feeding, bringing them right into the bay. Migratory sightings are more common during the summer, but resident whale sharks frequent Tofo year round. Still relatively unknown, this region is quickly gaining popularity among liveaboard divers, thanks to its variety of large pelagic species. The reef is a permanent home to manta rays, white tip sharks, leopard sharks, and devil rays. Migrating humpback whales can also be seen during the summer months. The Marine Megafauna Foundation is currently working with liveaboard operators and dive centers to increase protection for these beloved species. Liveaboard itineraries in Mozambique typically combine a visit to Tofo with other well-known destinations. The nearby Quirimba Islands and St Lazarus Banks are also hotspots for passing pelagics, known for calm waters and good visibility. Some boats even follow the South African sardine run up the Mozambique coast to Tofo.